Washington, Apr 24 (Just News): First Lady Melania Trump and President Donald J. Trump are excited to welcome President Emmanuel Macron and Mrs. Brigitte Macron of France for the Trump Administration’s first state visit. Upon the arrival, the two couples will plant a tree, a gift from the President and Mrs. Macron, together on the South Lawn of the White House. The sapling is a European Sessile Oak that measures approximately 4.5 feet tall with an estimated age between 5-10 years old. The tree comes from Belleau Woods, and is a historic landmark of the United States engagement in the First World War. Over 9,000 American marines died in the Belleau Wood battle in June 1918 and the forest is a memorial site and important symbol of the sacrifice the United States made to ensure peace and stability in Europe. This evening, the two couples will depart the White House on the Presidential helicopter Marine One, for a scenic tour of historic monuments in Washington, ending at Mount Vernon—the iconic home of America’s first President, George Washington. After the dinner, the First Lady will open the State Floor for a press preview of the state dinner setting and décor. The Office of the First Lady has prepared the following details, all carefully selected by First Lady Melania Trump, to complement and pay homage to the long-standing friendship between the United States and France. 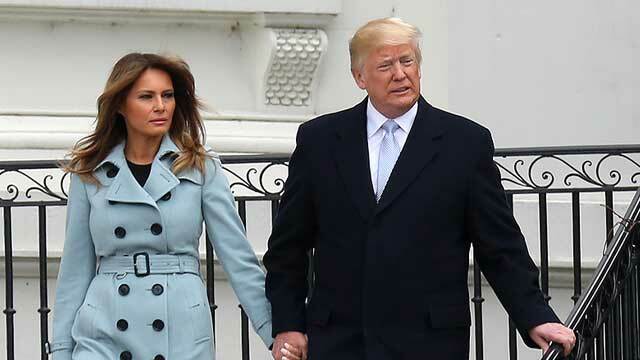 On Tuesday Morning, April 24, the President and First Lady will host the State Arrival Ceremony on the South Lawn of the White House. With the practice tracing back to the 17th century, the Trump Administration is proud to carry on the traditional military arrival ceremony. Nearly 500 members of the United States Armed Forces from all five military branches will be on the South Lawn for the traditional “Review of the Troops.” Guests invited to attend the ceremony include Cabinet Secretaries, Members of Congress, military families, and students from the Maya Angelou French Immersion School in Temple Hills, Maryland.